Why is there such a clear correlation between a well-written cover letter and an excellent team member? Because of what good writing represents. Writing is a pinnacle skill. In order to write well, you have to have a range of other skills in place first. They are the underlying foundation. 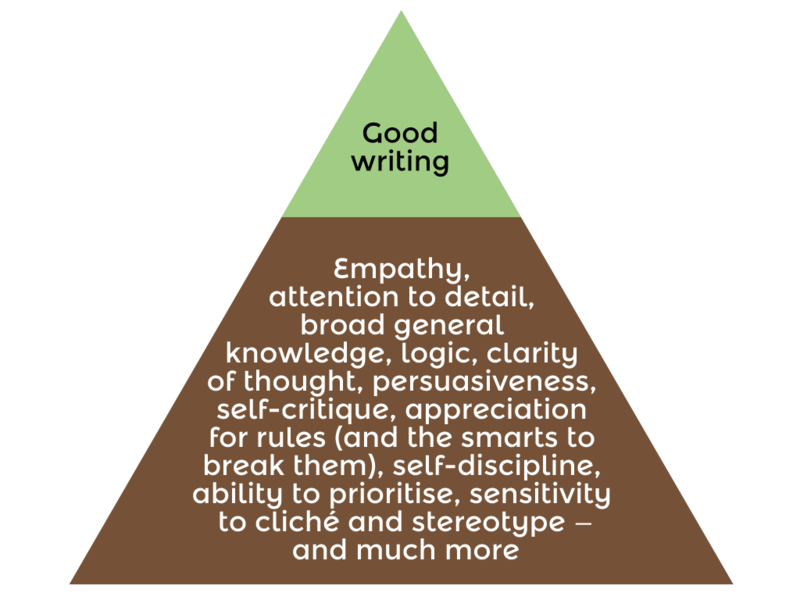 Once you have those other skills, good writing represents their combined result: the pinnacle of their positive effects. When I read a great piece of writing, I know the writer has those foundational skills. In this diagram I only list a few off the top of my head: empathy (which is an appreciation for what your audience is thinking and feeling), attention to detail, a broad general knowledge, logic, clarity of thought, persuasiveness, the ability to critique your own work (also called a crap detector), an appreciation for rules and the smarts to break them, self-discipline, the ability to prioritise, a sensitivity to cliché and stereotype – and more. And there it is — an easy way out, right there in the third sentence: “The days are hot and dry, your thirsty, tired, and homesick.” Not “you’re,” but “your.” The essay may go on to articulate inspired truths about human nature. It may reveal some novel insight that has never been revealed before. But here’s the rub: This admissions officer with the limited time and frustrated spouse is done. Three lines into the essay, the application lands squarely on the “No” pile. This example tends to upset my students. They wail, “But that’s unfair! Shouldn’t it be the ideas that count? That’s about appearances, not content!” And they are right. Ideas should be judged on substance rather than appearances, but this simply is not how our world works. We live in a society where appearances matter, where in order to be heard and taken seriously we are judged quickly and superficially. There is nothing superficial about judging someone on their spelling. Unless you really are stranded on a desert island without a dictionary, the Internet, or a smart friend, a spelling mistake demonstrates a clear lack of fundamental skill or temperament. Misspellings – especially in business documents – are the symptoms of an underlying carelessness that to employers, clients, colleagues, and fans can and should be deeply troubling. The quality of your writing is a clear indicator of the quality of your mind. And while spelling is only one part of good writing, it’s a crucial one: get it right, and you give your work a chance to shine – and you to shine through it. During my childhood, I had several great teachers (aside from my parents). Like most nostalgic adults, I remember them not for what they told me, but for what kind of people they were. Among mine, perhaps the greatest was Charlie Baty, for many years Akela of a troop of cub-scouts in the small town of White River. Charlie passed away recently. He had helped lead the troop since 1963. I was one of his young cubs in the mid 1980s. Every time I tie a reef knot (“left over right and under, right over left and under”) a sense of impending adventure rushes back on a wave of adrenalin. Only recently, reading a reunion newsletter Charlie wrote a few weeks ago, did I also remember how the troop’s leaders kept us firmly on the straight and narrow: our fingernails neat, our socks up, our buckles polished. Falling short was punishable by a penalty I don’t recall, but which I feared as something akin to banishment. Saturday-morning cub meetings seemed to me to run like a Swiss clock. As children, we could have resented the strictures of it, but I remember following Charlie’s every instruction with single-minded enthusiasm. He was one of those rare individuals who could treat a child as if they were the most important person in the world – not by acting out some special formula, but by genuinely believing it. Getting people to follow you is more about passion and belief than any amount of craft. This was Charlie’s gift to his young charges, who in letters and messages of condolence still gather around his big heart like a pack at a campfire.